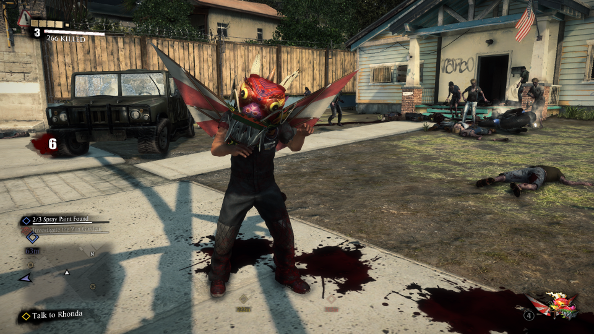 Dead Rising 3 and its gargantuan zombie hordes have arrived on PC, signaling the end of another console exclusive. And this time around, it’s not shackled by awful Games for Windows Live – which is undoubtedly worthy of celebration. But all is not well in Los Perdidos. The augurs suggested this of course, as did Capcom’s confession that we’d be faced with 30fps limit. In 2014. On PC. With a bit of fiddling, this limitation can be overcome, but it might not be enough to rescue this port. This third outing in the “let’s crank the zombie apocalypse up to 11 and throw in funny costumes” series is very, very, very stupid and absurdly good fun. It’s lazy as hell when it comes to the narrative, the characters and the tension, but it’s also zombie sandbox where you can dress up like a Chinese dragon and kill zombies with a dragon punch. Swings and roundabouts. Okay, so maybe the increased silliness doesn’t make up for the loss of the claustrophobic tension and the ominous timers constantly ticking down. 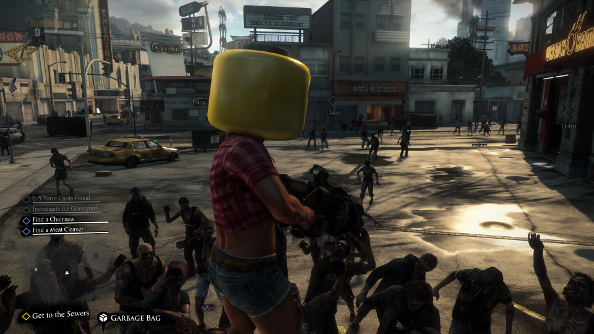 In terms of complexity and direction, Dead Rising 3 is the worst of the bunch. Yet it’s an absolute hoot to play, despite this. 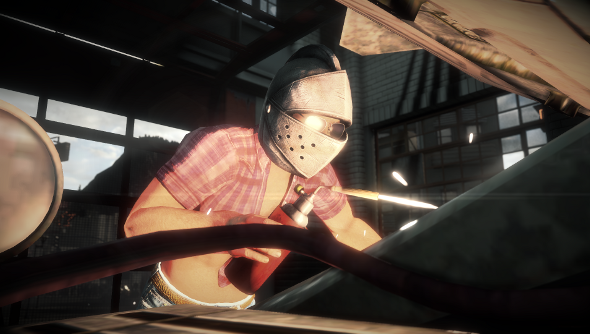 The over the top, crafted weapons – like rocket fists and a variety of post-apocalyptic custom vehicles – and the mind-bogglingly large ocean of waiting zombies ensure that. Before I get into the nitty gritty, and maybe make a few people pretty disappointed, I feel I should emphasise that this is the best version of Dead Rising 3. It comes with all of the DLC episodes, is a damn sight prettier than the Xbox One version, and has improved textures – though I believe this is mostly in the cutscenes. And, of course, it’s cheaper than its console counterpart, even if only by a couple of quid. This does not mean, however, that it’s a good port. Let’s start on a high note: the control options are mostly solid. Capcom recommends a gamepad, and I played using my 360 controller most of the time. It was just what you’d expect – after all, it was originally designed for a console. The surprise is that using a mouse and keyboard is actually very viable. Indeed, in some cases it feels a little better compared to using a gamepad. The balance between precision and a sense of weight is spot on. And you can customise the controls – something you can’t do on the gamepad. It’s let down a little thanks to mouse acceleration, but this only comes into play when aiming throwing weapons and guns, and you’ll likely spend most of your time in melee. Delving into the options reveals a very limited list of supported resolutions, vsync (which I usually keep off because I don’t have screen tearing issues) and three preset graphic profiles. The highest preset, unbelievably, renders the game at 720p, which is also the default, like its Xbox One counterpart. You should just ignore the presets and use the advanced options instead. Capcom have offered a decent amount of graphical options that you can tweak, including the level of detail, AA type (FXAA, SMAA, SMAAT2X) and texture filtering, ambient occlusion, and, of course, zombie quality. The “Game Quality” option is a bit of a quirk. 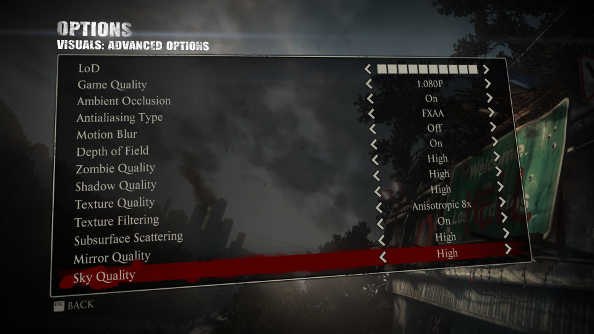 Choosing the resolution in the previous menu will change the resolution of the HUD, but to get the game rendering above 720p, you need to change the game quality option too 900p or 1080p in the advanced options menu. The options are a bit inconsistent though, which isn’t uncommon. Some options are split into high, medium and low, while others just have high and low options. The level of detail option is completely different, though, and is represented by 10 pips. Most of the options have a surprisingly low impact on the game’s performance, particularly the zombie quality, which – given just how many of them there are – you’d really expect to make a significant difference. It’s just the level of detail and game quality that will really improve or reduce performance. 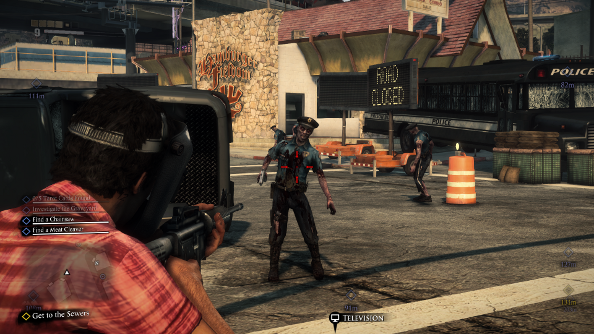 Dead Rising 3 at 1080p, with everything else at max looks mostly fine. Slightly muddy textures are common, but the city of San Pedro is detailed and busy – mainly with the undead. And those zombies look great. There are enough distinct models so that you won’t feel like you’re being assaulted by an army of cloned corpses, and they have been deftly animated. You should be able to see quite a disparity between the max settings and high preset. But no matter how much you fiddle with the in-game options, you won’t be able to enjoy a frame rate higher than 30. Not unless you do some extra faffing about outside of the game. 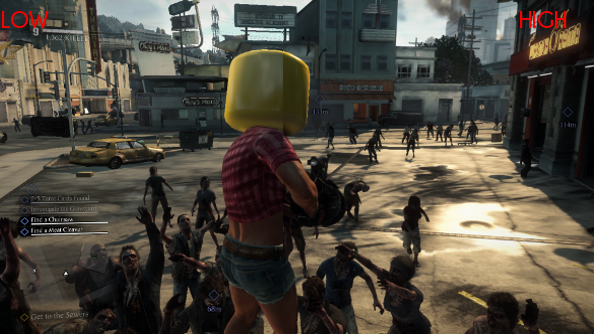 Dead Rising 3 was designed to run at 30fps, but it can be unlocked. All you need to do is go into the install directory (where the Dead Rising 3 executable is) and create a user.ini text file. Then you need to add “gmpcr_unlock_frame_rate = True” without quotation marks. Unfortunately, since the game was not designed to run above 30, there’s been no optimisation to ensure you can hit 60 or more once you unlock it. In my case, with a rig that’s getting a bit long in the tooth, but is teetering around the recommended mark, I had to put up with very inconsistent performance. It was constantly jumping between 30 and 60 on my custom settings (everything max, FXAA, anisotropic filtering x8, motion blur off). Yes, I don’t have an amazing system, but turning it down to the high preset – remember, that knocks the game down to 720p – still caused a lot of frame rate issues. Despite the massive drop in quality, the frame rate continued to be inconsistent, fluctuating between 40 and 60. And this wasn’t just when there were a lot of zombies on the screen or things exploding left, right and centre. Dropping it down to low – which turns the game into a hideous, blurry mess – ensured a stable 60fps, but it looks really quite terrible, especially in motion. Even if you have an impressive machine, this does not mean you’ll suffer no problems. You’ll be able to get a higher frame rate, certainly, but you’ll still struggle to get a consistent one. 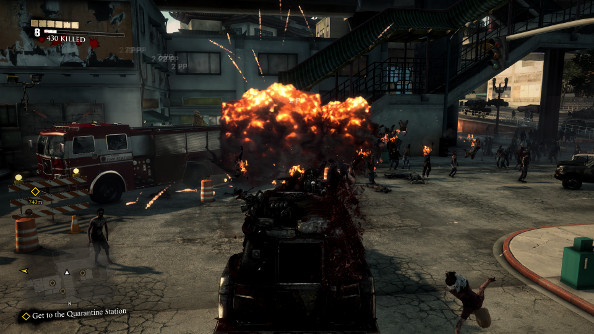 It’s also worth noting that, at the moment, Dead Rising 3 does not have SLI support, either. 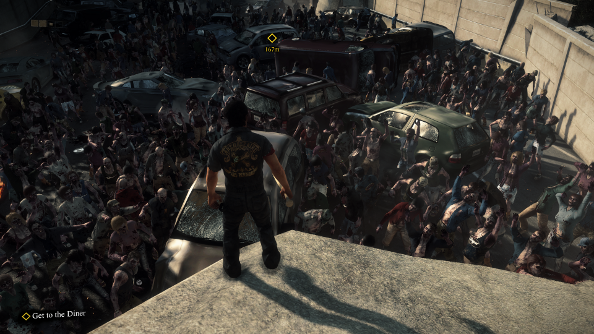 Dead Rising 3 is a demanding game, but doesn’t feel like it should be. Even with the highest settings, it’s never going to impress. An excuse could be made due to the vast number of zombies on the screen at any given time, but changing the quality of these undead monsters doesn’t really improve performance. While Capcom claims that this is not a straightforward console port, the texture quality, pop in, lack of SLI support and the default frame rate of 30 and rendering resolution of 720p makes it seem like that’s exactly what it is. But it’s also really fun – which makes the unevenness of the port a bit more disappointing, really.